The 2 Tatamis 90 + Futon Cotton Latex Comfort combo offers you an authentic traditional Japanese bed. 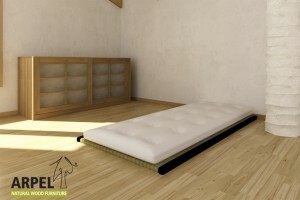 The high quality tatami is 5,5 cm thick and the futon batting consists of pure cotton and latex. To complete your bed, have a look at the different beautiful accessories such as a futon headrest, pure cotton cushions and original Japanese-style bedspreads. Combi package 3 Tatamis 70 + Futon Cotton Latex Comfort is offering you an authentic traditional Japanese bed. The high quality tatami is 5,5 cm thick and the futon consists of pure cotton and latex. To complete your bed have a look at the different beautiful accessories, futon headrest, pure cotton cushions and original Japanese-style bedspread. Combi package 3 Tatamis 80 + Futon Cotton Latex Comfort is offering you an authentic traditional Japanese bed. 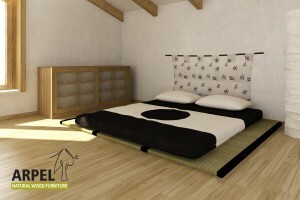 The high quality tatami is 5,5 cm thick and the futon consists of pure cotton and latex. To complete your bed have a look at the different beautiful accessories, futon headrest, pure cotton cushions and original Japanese-style bedspread. Combi package 3 Tatamis 90 + Futon Cotton Latex Comfort is offering you an authentic traditional Japanese bed. The high quality tatami is 5,5 cm thick and the futon consists of pure cotton and latex. To complete your bed have a look at the different beautiful accessories, futon headrest, pure cotton cushions and original Japanese-style bedspread. Combi package 3 Tatamis 100 + Futon Cotton Latex Comfort is offering you an authentic traditional Japanese bed. The high quality tatami is 5,5 cm thick and the futon consists of pure cotton and latex. To complete your bed have a look at the different beautiful accessories, futon headrest, pure cotton cushions and original Japanese-style bedspread.